Chemical warfare was first used in WWI. Tear gas, severe mustard gas, phosgene and chlorine were used. Then, only 4% of the deaths were from these weapons in the worst war ever. They've all been outlawed. Saddam Hussein used chemical weapons against the Kurds anyway in Iraq in the late 1980's. He killed thousands with mustard gas and nerve agents with arial bombs, 122 mm rockets, and conventional artillery shells. Nothing is impossible in the Middle East when powers that be want to gain more power, evidently, even the grotesque death of victims gasping for breath or going through trembling gyrations. This horror is hitting Syria where the shooters are still unconfirmed. Is it the rebels or the government of Syria doing this dastardly deed, and how many groups make up the rebels and what is their aim? Some rebels are people that belong to al-Qaida or Hezbollah, terrorist groups. Israel has had to dispense gas masks to their whole population, now 7 million, several times in order to try to protect them from maniacs who would attack by chemical warfare, something that is outlawed according to the Geneva Convention. 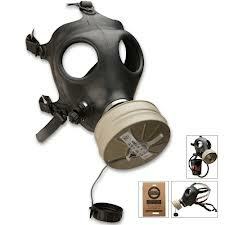 My cousin Stanley was in an attack in his home in Jerusalem where everyone had to don their gas masks around 1993. They feared the worst and again were issued masks in 2010 and 2012. Bathrooms were to be sealed as a safe room. Syrians are at the mercy of a government that is against their own populace. They first destroyed the Jewish community of which the last was able to escape in 1994 when an airlift took them to Tel Aviv, Israel. They were living in Gestapo-type ghetto-like conditions, unable to have any civil liberties. Now it is the few Christians who are in danger. Syria had 22,505,000 people of which 90% are Muslims, a mixture of Sunni and Shi'a They have no stated state religion as some states do in the Middle East. Today Syrians have fled to refugee camps in Jordan, Lebanon and many fled to Egypt under Morsi's short reign, who hoped they were all proponents of the Muslim Brotherhood, and are not even registered refugees receiving UN aid, but are about out of their own funds to help them to survive. Work there is impossible to find under their present emergency. The UN would do well to survey that situation. 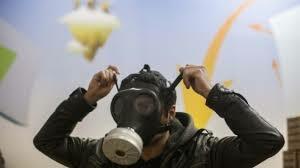 The USA was aware of chemical warfare being used early this year when they confirmed this knowledge and said they would supply some form of weapons to the rebels, but have since had second thoughts about "rebels." Rebels could be any of the terrorist groups, Hezbollah or al-Qaida who have immersed themselves into the remaining population. Israel's intelligence strongly suggested a chemical weapons attack, but the rebels have pointed out where 4 rockets had been fired from that proved that the attack could have been carried out only by the government's forces. Sane people question how that could be when this happened on the day the inspectors had arrived in Damascus to check out previous attacks. The timing is incredibly idiotic. Russia thinks the rebels staged the attack, which does sound logical to me as it's so incredible that the government would do it upon the inspector's arrival. . The rebels reasoning is that the government is softening up the opposition before a major attack with tanks, armored personnel carriers and planes. The recent attack happened just after 2:00am. "Chemically equipped rockets were launched; 2 from a bridge on the highway from Damascus to Homs; others from a Sironex factor in the Qabun neighborhood of Damascus. Now the UN may not be able to send investigators in to collect samples from the wounded and dead. How will the UN respond to all this? The USA has combat aircraft, fighters and bombers for an air attack, but what is the target and will civilians be killed? The targets would be missile or artillery batteries that can launch chemical munitions of nerve gas and communications and support facilities, or on the headquarters and government offices of the government. These are all bad choices according to a European official. The USA is also divided over the proper response to use, as it was earlier. Until the world powers get their act together, someone should go into Syria with gas masks, food and water for civilians not involved. They are between a rock and a hard place, for sure. Resource: Oregonian newspaper, 8/23/2013, headlines: chemical quandary in Syria by Mark Landler, Mark mazzetti and Alissa J. Rubin, NY Times, front page and page A6.